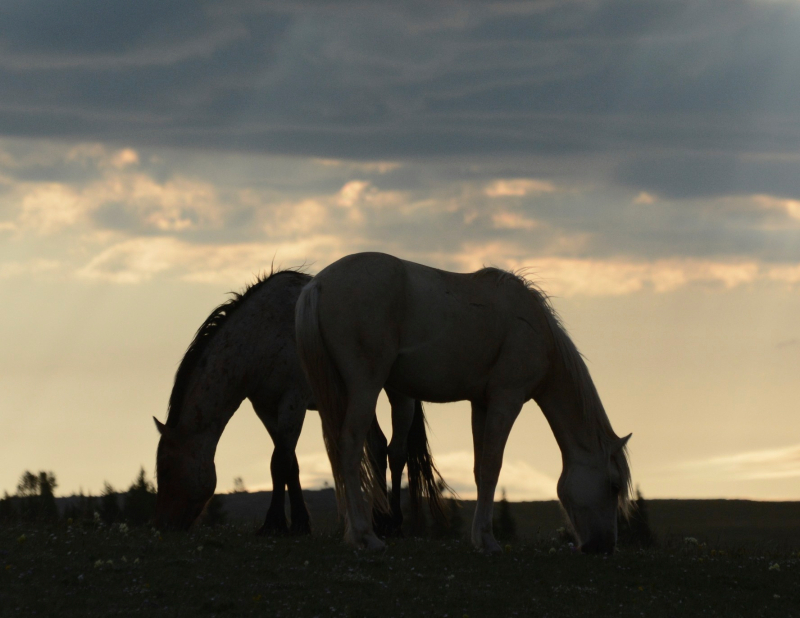 Mid-June is a time of transition on the Pryor Mountains of southern Montana where Cloud and his Spanish mustang herd live. Low, moisture-laden clouds drape the mountaintop so my friends, Linda Hanick, Pat Burge, and Penny Longnecker travel with me to search for horses in the low country, well below the storm. Joining us is a family from Iowa, hoping to see their first wild horses. Along the Bighorn Canyon, we spot the grullo stallion, Fiero and his family foraging atop a rocky hill. A short hike results in great viewing of the little four-horse band, including the yearling, Oregon, a classic Spanish-style filly. Quite a beauty, and on the Tier One Bait Trapping list, so she is likely to be removed if trapped. For all of us this is horribly sad, and we work toward a time when reproduction and mortality are equal so that removals are no longer necessary. 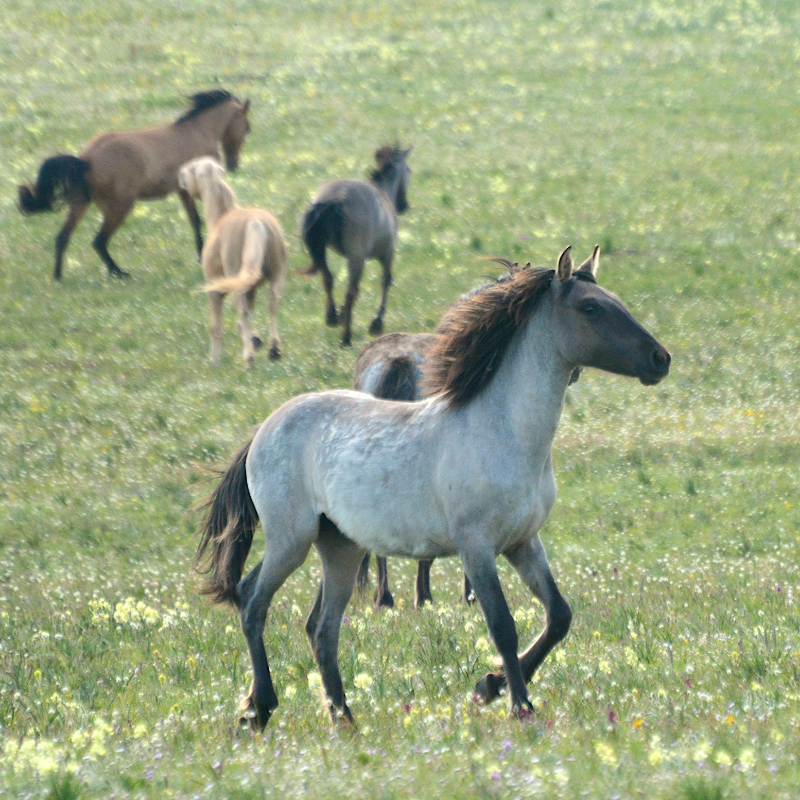 Our goal and the goal of conscientious BLM managers for the Pryors is simple: every foal born wild will live its life in precious freedom! 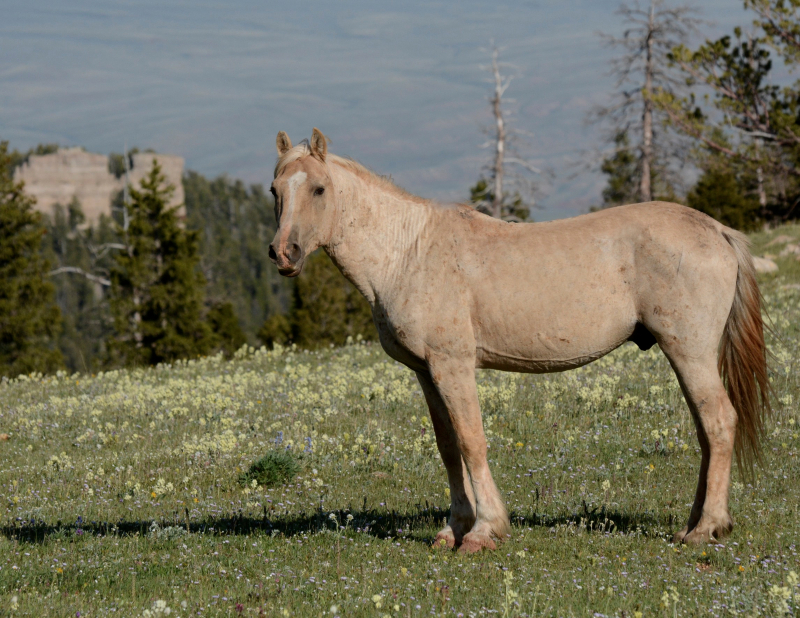 Fiero follows his mares to the very top of the windy hill, the Bighorn Canyon and Mountains their magnificent backdrop. In the afternoon we hike through the red desert, lit up with colorful cacti and an equally colorful newborn filly. She is the first foal born down here and is she a knockout–a pale red dun with a blaze. Her name is Prima, the daughter of Nova, the only truly red dun in the entire herd and the first off-spring of the handsome mahogany bay, Hickok. The next morning we were excited that the weather has cleared and we head up the mountain. 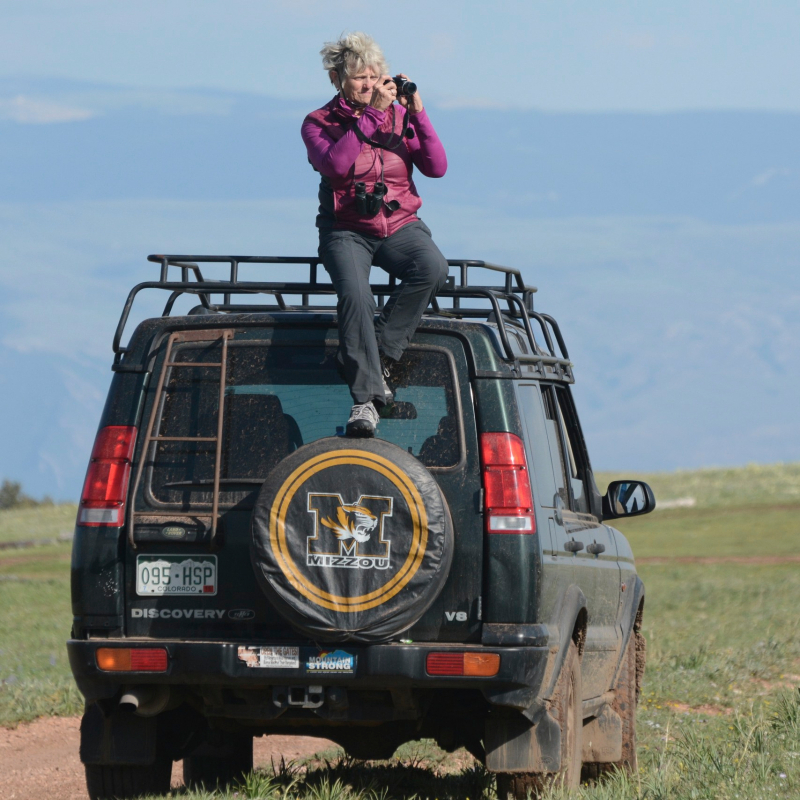 I love the long drive up Crooked Creek Canyon with its spectacular scenery and great chances to see wildlife. But it is always a heartbreaker for me when I near Tony Island and the Dryhead Vista. Vibrant green, open meadows are empty. Once Cloud and his herd spread out on these broad fields and forests, gaining weight on the rich forage that would help see them through the long winter to come. Then the huge wooden fence looms ahead, a constant reminder of the unfair decision by Custer National Forest managers to lock the horses out of their native lands that are so critical to the well-being of the herd. I believe the loss of this rich forage, has directly impacted Cloud. As a senior stallion, he just didn’t get the late nutrition essential for him to stay competitive. 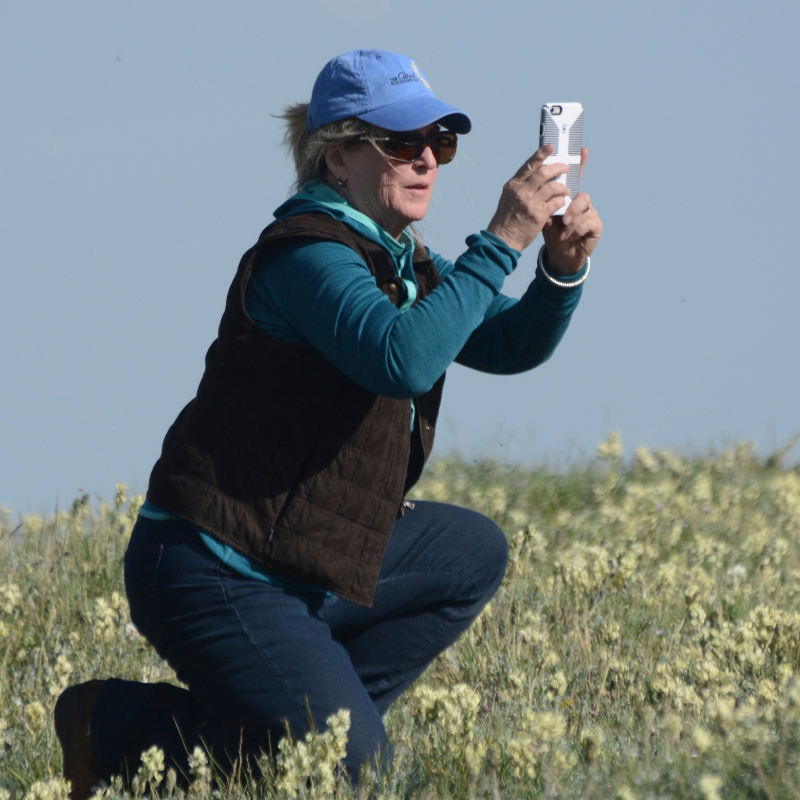 Inside the horse range, pasque flowers, the first to bloom in the upper forest openings still linger in the shade of the limber pines among hot pink shooting stars. A red squirrel warns one and all that we are coming. On the open meadows purple lupine are beginning to bloom. Most of the wild horse bands have gravitated to the top, drawn by early summer grasses and breezy ridge tops where biting flies are blown away, and where eager and playful bachelor stallions can scope for future mates. And where an older, pale stallion transitions from leader to loner. For the first time in 15 years, Cloud finds himself without a mare. 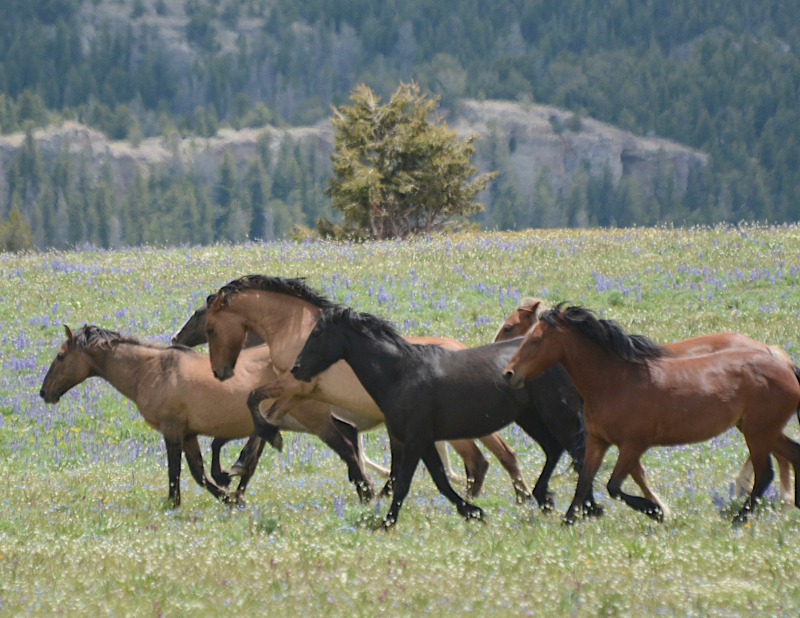 He was the dominant stallion on the Pryor Mountains for a decade, but in the past few years, his band grew smaller. This year he lost his last two mares, Innocentes and Feldspar along with his yearling son, Ohanzee, and daughter, Orielle. I watch Cloud stare down at the bands in the fields around the snow-fed waterhole and wonder what he is thinking. He watches his son Bolder and grandson, Echo and the rest of Bolder’s band. Although Echo is five years-old, the pale palomino colt still nurses his mother, Cascade, and continues to lay claim to Bolder’s senior mare, Cedar, snaking her about under his father’s nose. It is clear that Bolder has fought with Echo whose coat is riddled with war wounds while Bolder’s coat is absolutely pristine. It’s certainly a dilemma for Bolder. If he runs Echo off for good he risks losing both Echo’s mother and Cedar. Time will tell how this complicated situation resolves itself. Mescalero’s Band, in comparison, is the picture of serenity. Cloud’s Pride plays, nurses, and sleeps in the lupine, and investigates his surroundings, scratching on snags, and sniffing rocks. The sturdy buckskin foal has inherited his pale color from his great-grandmother, Isabella, Cloud’s grandmother. His color is called “Claybank” by the Crow Indians. Only the wife of the chief could ride a claybank-colored horse. Pride sleeps in a bed of lupines and I think how closely his color matches the banks of the nearby Bighorn River. Above the snow-fed waterhole a huge drift lingers, feeding the waterhole below. Band after band comes to drink here and to play in the water. Marmots dash from their rock hiding places along the bank of the pond. Many family groups stand on the drift where it is cool and there are fewer pesky insects to deal with. On the snowdrift, dominance can be easily assessed---who will stand in the center, and who is relegated to the edges, and which band lingers longest while others move off. It’s also a fun place to watch young horses from different family groups getting acquainted and revealing their individual personalities. Chance and Galadriel's bright orange daughter, Oceana, has a particularly strong sense of self as she threatens Custer and Felicity’s son, Navigator. Then she dashes playfully away. Mescalero’s band comes onto the snow above Doc’s band. Pride notices a dark foal just his size. He walks hesitantly down to sniff noses with little Petra, the daughter of Doc and Galena. How sweet I think. Then, without warning, Doc lunges at Pride, nearly knocking him down. The colt is quick, however, and scrambles up to his mother and the rest of Mescalero’s remarkably protective mares. I wonder if Doc’s misplaced aggression is really a cover-up for some underlying insecurity? During our visit we never see Cloud visit the snowbank. But, at times he really seems to enjoy interacting with the young stallions, including his flashy blue roan son, Mato Ska. At other times, he seems content to graze alone. I sit with him for a long time, wishing he could tell me if he is satisfied having zero responsibilities. His angelic-looking daughter, Encore, seems quite content with her young stallion, Knight. I spot them at dawn grazing together. They are usually a bit apart from the dominant bands and Knight keeps watch, snaking Encore away from any perceived danger. What a brave filly. And what a brave young stallion. I hope he can hang onto her. Linda, Pat and Penny reluctantly leave, but not without a few last looks. It’s been grand sharing this time with them. I stay on for a few more days and Kristen Collett joins me, helping tote my HD camera and tripod around. As Linda did, she picks up my still camera when I am filming. She took this wonderful picture of Pride playing with Missoula at sunset. At sunset Pride is bold, playing with the three-year old Missoula until play gets too rough and he returns to his mother. As I leave the mountain to travel back to Colorado I take one more, short hike to see Pride. He is sleeping and the band has moved away from him as Baja’s band moves in beside the colt. Baja looks back and forth between the colt and Mescalero’s band with Feldspar. I can almost see the wheels turning in his head. Baja moves toward Mescalero, then charges in, driving Feldspar toward Pride. The colt hears the commotion and pops up. Baja has Feldspar on the run with Pride racing beside her, but Mescalero’s mares catch up, running between Baja and Feldspar. As Mescalero moves to intercept Baja, the mares collapse around the colt, shielding him from the alien stallion. What a remarkable display of affection for the little buckskin by the mares. Bless you Polaris, Broken Bow, and Rosarita! I begin the long drive down the mountain, confident that Pride is secure in this big band, and hopeful his father will take his bachelor status in stride, as he has all the many challenges in his storied career. I believe, on some level, Cloud, is aware of the many good wishes people are sending him from all around the world. P.S. Please continue to support us with your donations as we fight against BLM plans to render both wild horse mares and stallions unable to procreate—operations in the wild that could result in lingering deaths. Donate to Save the Mustangs. 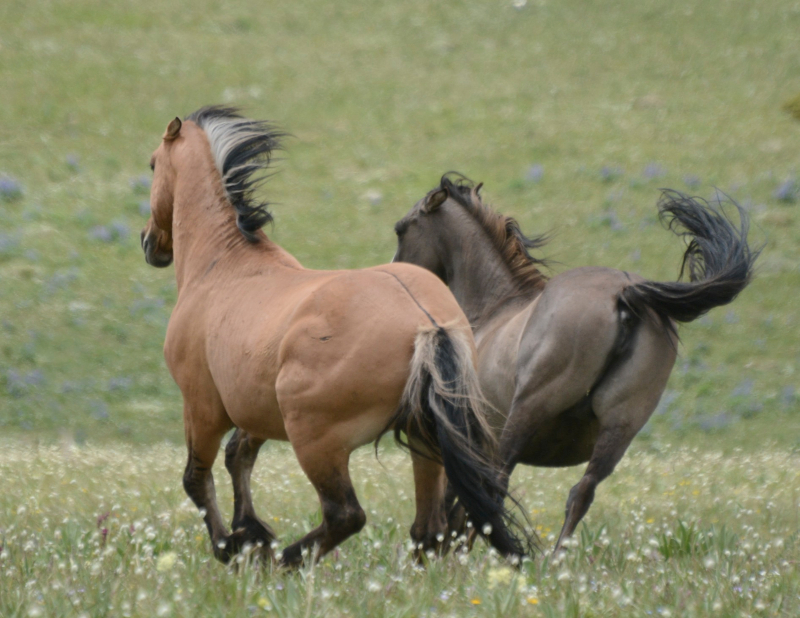 BLM in western Colorado seems poised to completely remove our historic West Douglas wild horse herd in Colorado as early as September 15th, and we will need your help for another legal battle to stop them. Donate to the Mustang Legal Fund. 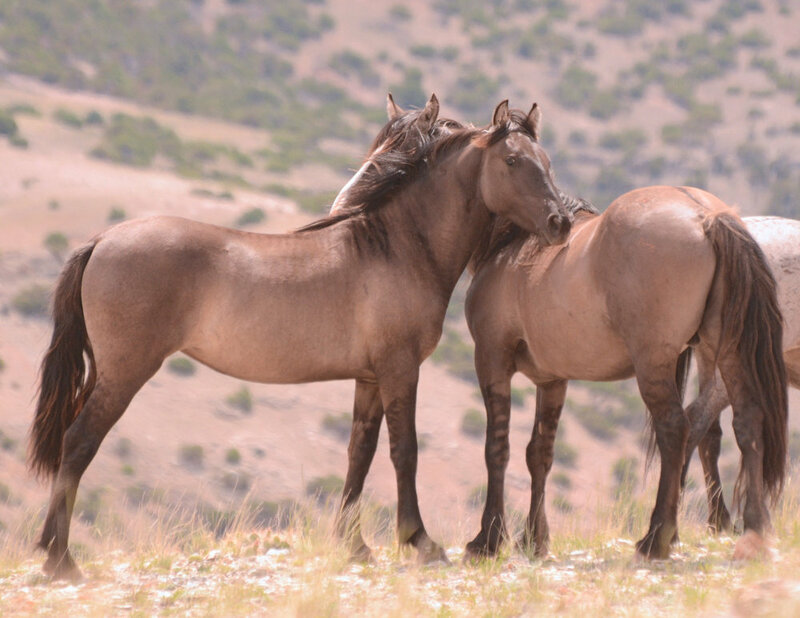 And Utah legislators have introduced a bill to modify the Wild Horse and Burro Act to give control of our wild herds to unfriendly state governments. If passed this could mean the end of our wild horses in all ten western states. Read the bill here. We will keep you informed about what is happening and how you can best help. Thanks again for your loyal support! Cloud’s 20th Birthday: Look Who Came to the Party!